I was flicking through cook books for some weekend cooking inspiration. I have been wanting to try something from Purple Citrus and Sweet Perfume by Silvena Rowe for sometime. This book just caught my eye when browsing through Amazon and it was just too pretty to resist. The chilled sweet pea and watercress soup on the cover is a vibrant green and topped with a pink rose petal cream, it was a bit of a show stopper. In addition to all the prettiness there were all these exotic herbs and spices that immediately transported me to a world of kasbahs and souks. I simply couldn't resist so it was added to yet another order from Amazon to become a member of my ever growing cook book collection. I wasn't disappointed and it is one of my favourite cook book purchases of last year as it took me on an exotic journey through the Eastern Mediterranean - Turkey, Syria, Jordan and Libya. It is full of recipes spiked with exotic herbs and spices and desserts laced with fragrant rose and orange blossom waters. 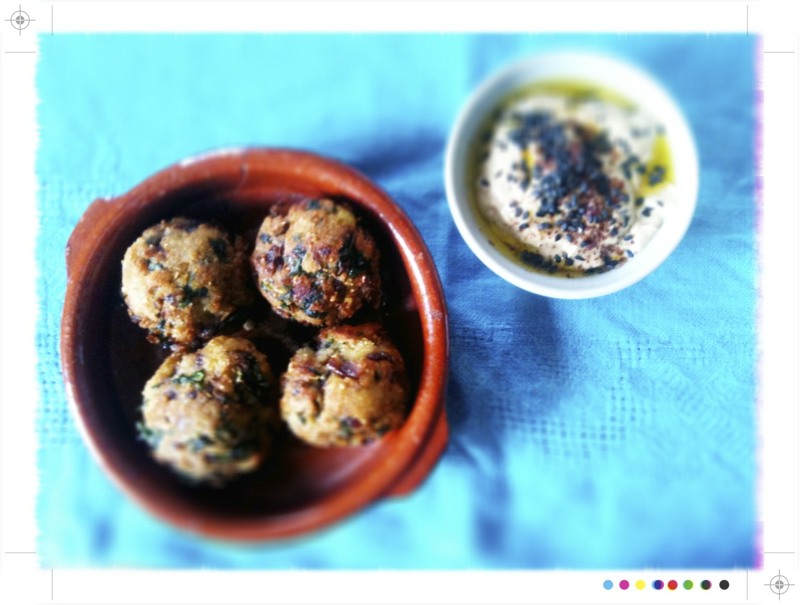 These falafel along with some red lentil kofte with promegranate and coriander salad have been jumping out at me every time I have ducked in for a little read. The falafel won out as a large bag of greens needing used. 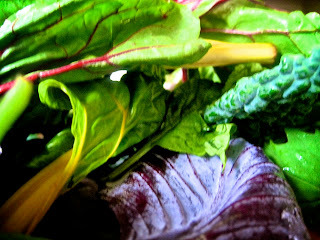 Minimal tweaking as I had a bag of mixed greens...including red and yellow swiss chard, cavalo nero and kale. So they all went in to the mix. I also forgot the chick peas! I would definitely add them in next time as I think they would add another layer of texture. However, sans the chick peas they were still crispy balls of deep fried chick pea like deliciousness. Terribly moreish. 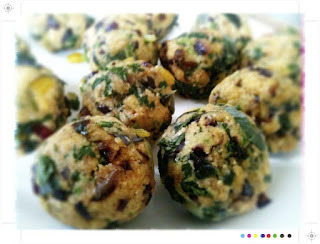 This is a fantastic base recipe for falafels and I am thinking they could be flavoured with all sorts. 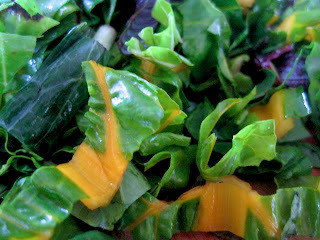 Thinking next time maybe a spinach, feta and chilli combination or perhaps roasted peppers and a little smoked paprika. So yes there is potential for a glut of falafel recipes. I used rice bran oil which has a high smoke point for the deep frying and so it becomes fiercely hot...so hot that my little falafels were golden brown very quickly. 3-4 minutes, as per the recipe, and they would have been way beyond crispy golden brown and more of a charred debacle. Not a problem, I just removed them from the hot oil and popped them in to a 190C / 375F oven for 10 minutes to cook and heat them all the way through. This also means you could feed a crowd, deep fry in batches and pop in the oven for 10 minutes just before serving. 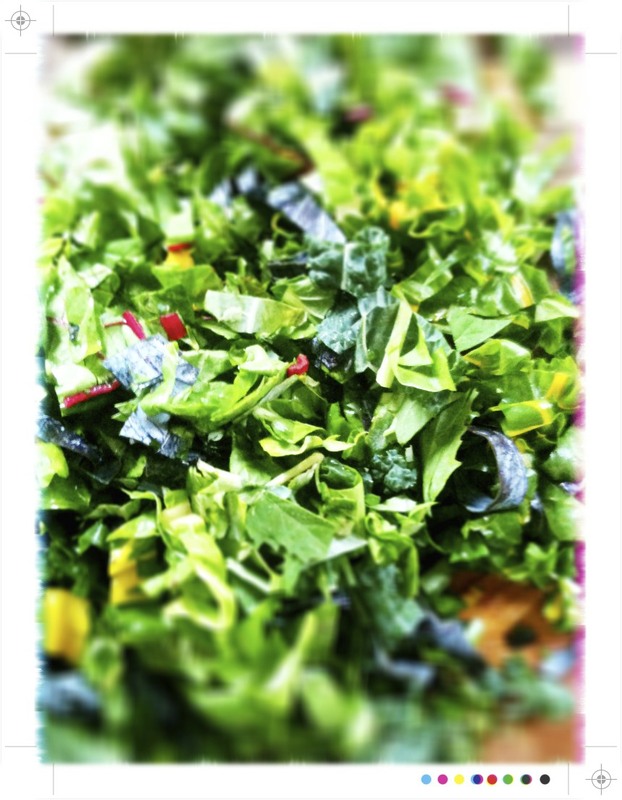 500g / 1lb greens - swiss chard, cavalo nero, kale, silver beet, spinach would all work. 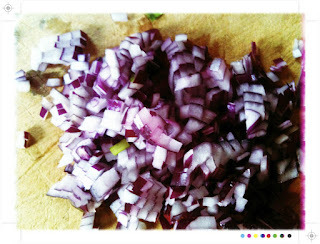 Heat 1 tablespoon of olive oil in a frying pan and fry the onion, cumin and allspice, over a medium heat, for 3-4 minutes. Then place the onion in a bowl and set aside. Bring a large saucepan of water to the boil and blanch the greens for a couple of minutes, you want to leave a little crunch to give the falafels some texture. Drain immediately and when they are cool enough to handle give them a good squeeze to remove all excess water. Soggy falafel are not what we are aiming for. In a medium saucepan heat the milk, bring to a boil and then reduce to a simmer. 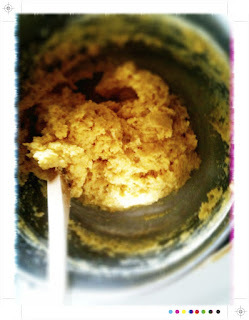 Little by little whisk in the chickpea flour, keep whisking constantly, to avoid any lumps, until you have a smooth paste. Season and add the remaining olive oil and cook on a low heat for 8 minutes, stirring all the time with a wooden spoon. The mixture will come together in a big ball and come away from the sides, just like choux pastry. 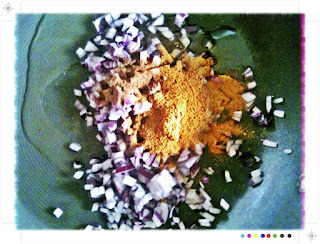 Cool the mixture and once cooled mix in the onion, chick peas (unless of course you forget them! 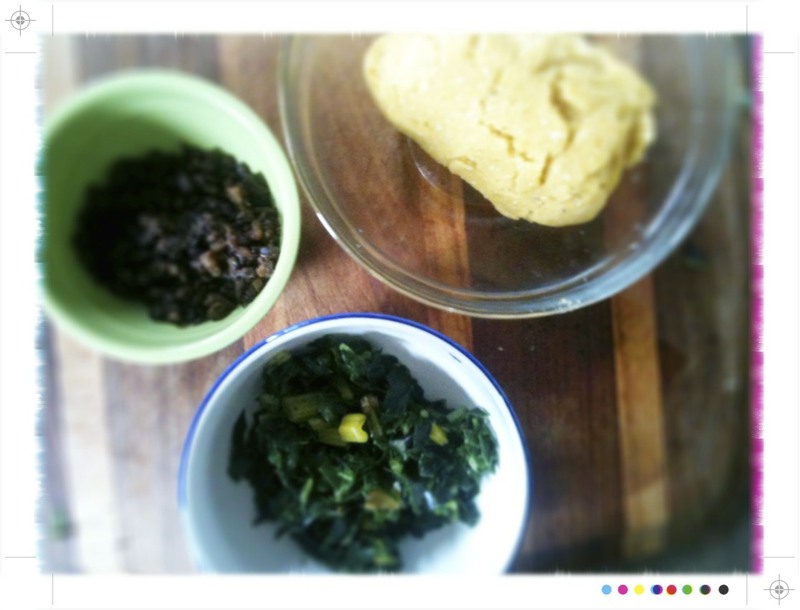 ), lemon juice and greens. Take a tablespoon or thereabouts of the falafel mixture and roll it in to a small ball and place on a plate. 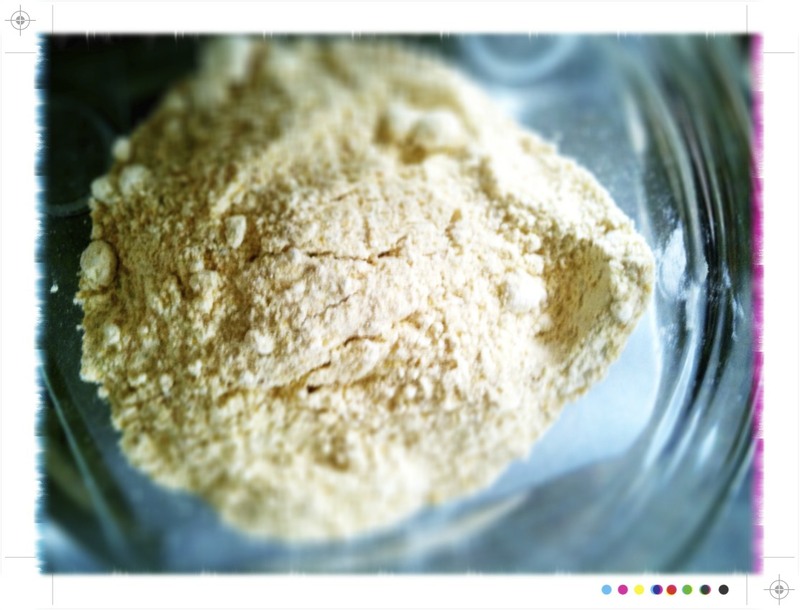 Repeat until all the mixture has been used up. 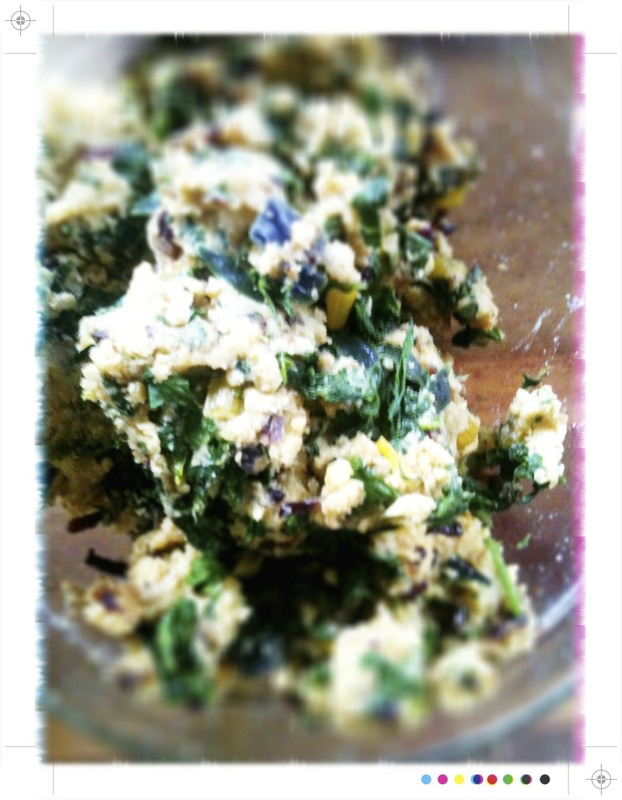 Chill the falafel in the fridge for 2 hours. Heat the oil in a saucepan. It needs to be deep enough to cover the falafel. Place the falafel in to the hot oil and fry for 3-4 minutes. Deep fry in small batches and take care not to over crowd the pan as overcrowding will reduce the temperature and result in not so crispy falafel. Remove from the oil and drain on some kitchen paper. If like me they are becoming golden too quickly just pop them in to a 190C/ 375F oven for 10 minutes to heat through. Serve immediately with tahini, sumac and lemon sauce. In a small bowl mix together the tahini, cumin and lemon juice. Stir in the water little by little. You want the mixture to be the consistency of double cream. Add the garlic and season to taste. This would also make for a great salad dressing. Add the sumac to the olive oil and mix to combine. Drizzle over the sauce and finish with a sprinkle of black sesame. 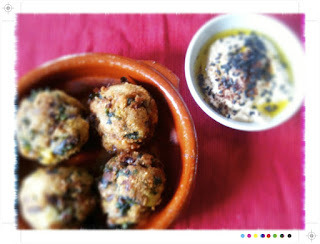 The falafel were crispy on the outside and soft on the inside, flecked with cumin scented onion and little bites of green goodness. Dipped in to the tahini, lemon and sumac a quite delightful combination with the sauce provided a welcome citrusy hit form the lemon and sumac. Funny, I have been thinking of falafel all week now I will never be able to buy the mix after you have made your own! Don't you love sumac? I have been using it lots lately and have found it at Hobsonville Point farmers market at $5 for 100g amazing. Sounds very nice maybe we could try it if there is any time. 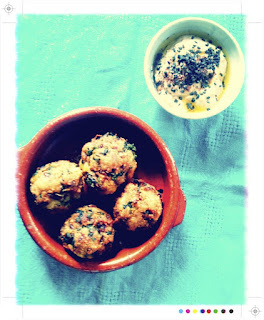 Alli you must try them, so moreish and yes I am a big sumac fan. Alessandra - yes delicious vegetarian food! 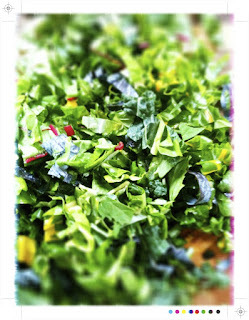 Laura,,,,so many greens they must be good for you!! Mum...yes would love to try & squeeze them in.